SURVIVOR'S AFFAIR HAS BEEN RE-RELEASED! With a new cover by Kent Holloway and freshly edited, the book that introduced the world to John Logan is here. For the past few years, you could only buy the first four books in the series in an anthology. I've heard your requests and so am releasing the books separately over the coming months. I was given some advice by a trusted writer friend of mine who felt that I needed to branch out and forget Logan for a while and write something else...something as far away from the Logan-esque genre that I could do. One of the realities of writing in this day and age is that series books often taper off in sales and in some respects, Logan is no exception. My sales aren't climbing through the roof with him anymore and every instinct in my being tells me to forget John Logan and go onto write something else. Finding a dead man on his houseboat was not what John Logan needed. Things have become uncertain with Teri and Logan just wants to know why she's not returning his calls. The last thing he wanted was to come home to a murder. The dead man on Logan's houseboat leaves few clues to who he was or why he was there. Who killed him and why? And why are people suddenly after Logan? Add an enthusiastic reporter snooping around asking dangerous questions and things could get deadly. The investigation will bring Logan back to the one place he'd swore he'd left for good and reveal secrets his former bosses don't want to know. Today it's official. I have had the publishing rights to the John Logan books (and future books) returned to me. What does this mean? It means that for the first time, I am becoming a self published author. This decision was not made easily but it felt right. The Internet has changed publishing tremendously in the past decade and the ability of writers to take more control over their content and characters was a big factor in my decision. 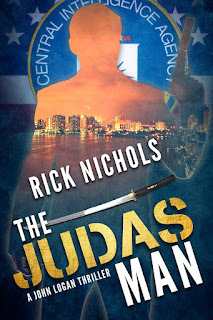 It also means THE JUDAS MAN is being put on an accelerated schedule and I hope to have it ready for you in July. There are some learning curves ahead for me but I know this is going to be a great opportunity for me. I have multiple lives. My work (i.e. regular job), my home/personal life, my writing life. It's a challenge at times to balance all of them and sometimes I feel like one or more of them get out of whack. When that happens, I have to make changes. I'm doing that to my writing life. This morning, I began taking steps to making some changes in my writing life. What will this mean for you? Not much, really, except that I think it will open the doors for me to share even more of my stories and thoughts with you. I can't discuss it further right now until the paperwork is signed so stay tuned!